Let me start off this post by stating that I love my children. I love spending time with them for 359 days out of the year (give or take.) But there was a time when I was not the happiest mom on the planet…far from it! I was cranky, tired and the people around me felt that negativity. Something had to give so one cold February in 2011, my husband was stressed to limit with work and I was a witchy crank so we planned a trip. Just the two of us. WITHOUT KIDS! Scandalous, right? I know, I was feeling a slight pang of guilt when we started to plan this trip and I was worried that the girls would miss us, but we were all VERY pleasantly surprised to see that none of that occurred when the time came around for our vacation. If you need a retreat where you can recharge your batteries, catch up with your spouse and feel like yourself again instead of whoever it is you feel you turn into when it gets to be too much, then here are some tips to help you plan a vacation to anticipate before and dream about long after you have come back to reality. The picture above and further below are from our first vacation alone together since our children were born. 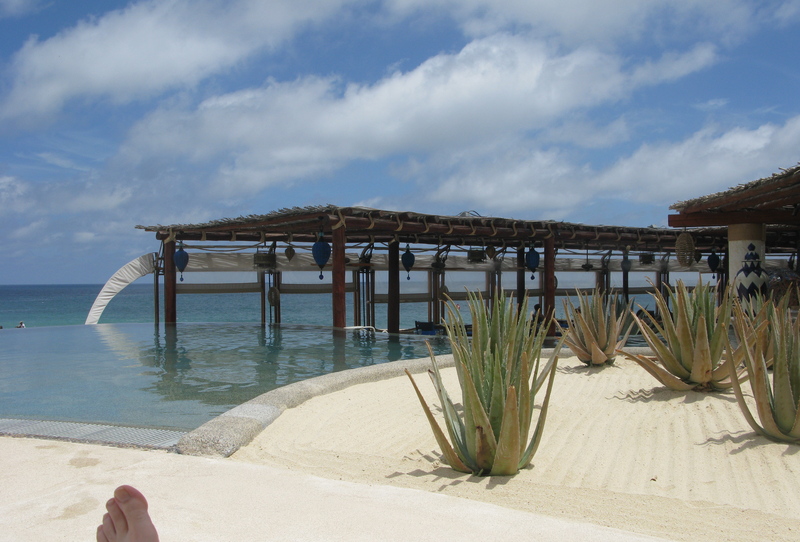 We went to Los Cabos, Mexico. Don’t Tell Mom The Babysitter’s Dead- The most important question is: Who will be caring for my children while we are away? This is crucial and for my husband and me, we were fortunate enough to have my mom watch them for six days. It’s a 6 hour trek for her to drive from Minnesota to Illinois, but she loves spending time with the girls and vice versa. If one set of grandparents is busy or not able to watch them the whole time, reach out to other family members like your aunts, uncles and cousins. Or even try breaking up the time between relatives so that the kids aren’t wearing everybody out while you are gone. If family is not an option, plan your trip way, way out, like a year. Try using a babysitter recommended through friends or neighbors for a few date nights and see how your kids feel about him or her. Work up to an overnight trip to see how things go and then see if you feel comfortable leaving for a long weekend. It may take time, but you will get to a point where you trust them enough for 4-5 days. Find Someone To Help With The Help– If you have the option of using family, try this idea. I hired a babysitter to come by in the afternoon when things began to get a little whiny, between 3 and 6 so that my mom could get a small break and prepare dinner, if needed. The girls had fun playing games with someone new and were less likely to act up. Plan, Plan,Plan– This is what moms do best. 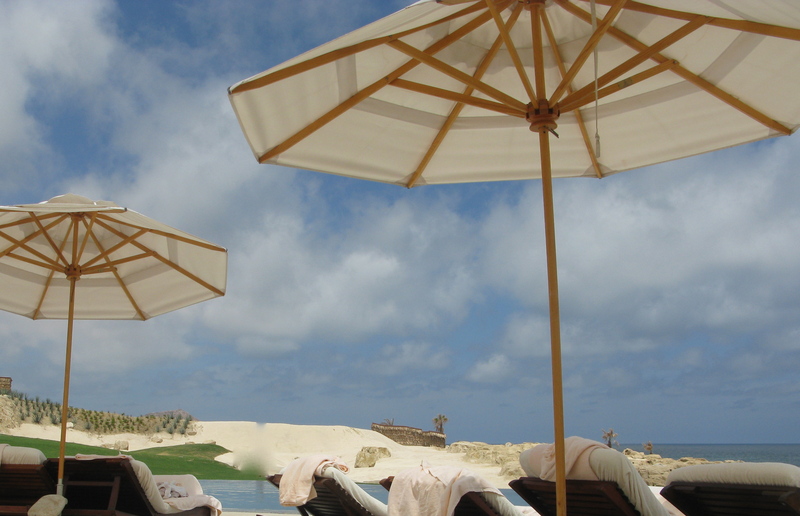 We think of every possible scenario and the last thing you want to mull over while sipping a cocktail by the pool is whether you left the phone number for your pediatrician in a prominent spot. If the kids are very small and somewhat picky eaters then lay out a menu. (A sample menu will be in my next post.) I left money for things like ordering a pizza or going out for ice cream a few nights too. Have a small first aid kit handy, important phone numbers including your hotel, your flight information and nap and bedtime schedules written down. Groceries– Get some fun foods for the kids to eat while you’re away like mini containers of Edy’s ice cream or the small cereal boxes that come in a pack of 10. Our job is to make sure they eat healthy foods most of the time, but the babysitter can have the glory of letting them indulge for a few days. Souvenir– Of course you can’t go somewhere and come home empty-handed so this probably goes without saying that you should pick up one or two small things you think the kids will appreciate. Call Me, Maybe– My husband and I still have memories of when our own parents took the annual vacations without kids and whenever they called, that’s when we realized how much we missed them and the waterworks started. It’s not a bad idea to check in once or twice, but we prefer to keep it at that and totally immerse ourselves into our vacation. After all, you are taking it to relax, but if you call and find out that Toby spilled his juice all over the floor or Timmy got a boo-boo, you will be stressing about a sticky floor or lamenting that you are not there to kiss it and make it better. In the grand scheme of things, everyone will survive for 5 days that you are away. Unplug and unwind. Now my husband and I look forward to planning our own vacation each year. We are closer as a result. Our children see that too and feel more secure knowing that Mom and Dad love each other more than ever. Oh, and cranky Mom? She still shows up sometimes, but it’s nothing a good workout or a night out with a few drinks can’t fix. Go on and plan your own trip. This is a challenge I am throwing out there to you. Let me know where you end up planning to go. Another favorite winery that we visited in Napa was Del Dotto. This winery gave off an entirely different and albeit, wonderful vibe. When we walked in the patrons were mostly young and friendly as were the staff. My husband and I were happy to do a tasting at the bar and sample some cheeses, but eventually went on the cave tour and I am so glad that we did. I knew then that this wasn’t just a general member of the staff, but I suppressed the urge to ask any questions. We walked into the dimly lit caves and learned that they were built in the late 1800s by Chinese laborers. Our guide pointed out the pick ax marks on the wall that also had some funky moss and tiny stalactites hanging from above. Edgar Allen Poe’s The Tell-Tale Heart kept popping into my head. Another couple joined us and introduced themselves and that’s when our guide told us his name, Giovanni. I finally asked if he was related to the Del Dotto’s and discovered that he’s their son. His sister is also working for the family business. Tada! The first wines we tried were a 2012 Cabernet. I have heard many times that 2012 was a great year because the weather was superb and created perfect growing conditions for the grapes. 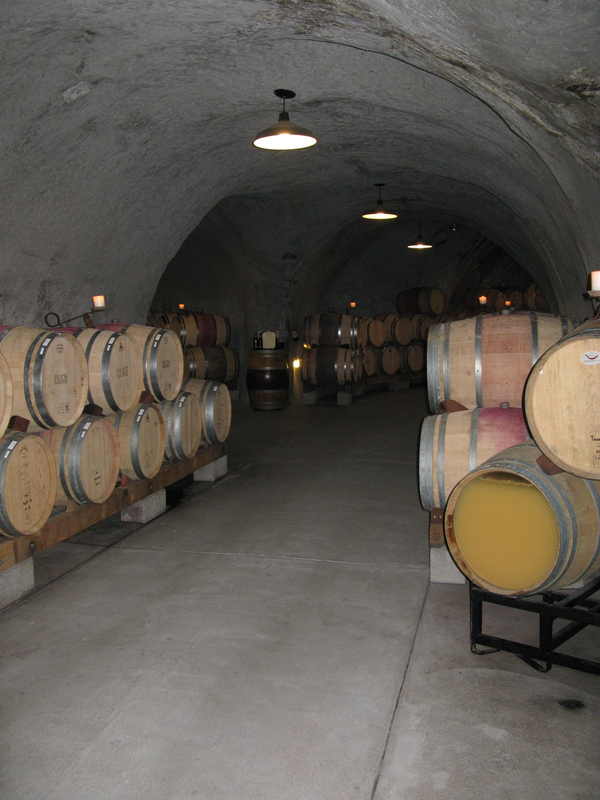 The same Cabernet was stored in an American oak barrel and a French oak barrel. You could taste the difference right away; either that or I was growing far too confident as a result of tasting so much wine. I prefer the former. The French oak tasted (to me) like cocoa and coffee. The American oak was like smoked meat. Amazing how different the same wine can taste by storing it in different wooden barrels. 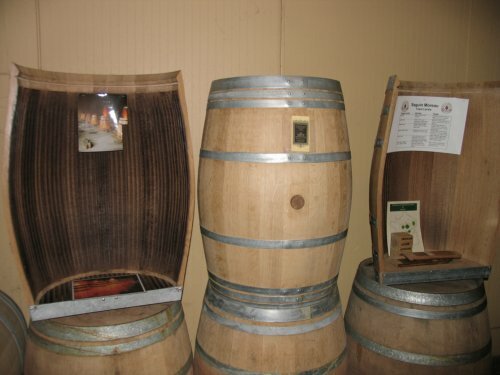 There was an example of what the inside of the barrels looked like on display. I was surprised and fascinated to see that the barrels had rivets running through the inside instead of a smooth surface. More surface area and more opportunity for the wine to take on flavor is my assumption. 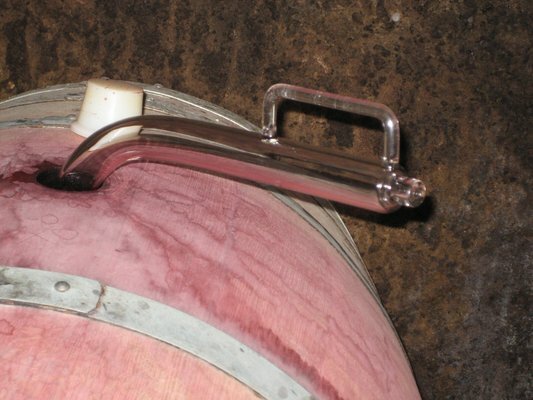 To sample the wine, Giovanni used a wine thief. Way better than my term: wine dispenser. My husband and I share a sense of humor that is probably equivalent to a 12-year old so our thoughts went to a bad place very quickly when we saw the wine thief. Giovanni saw our smirks and mentioned it was nothing compared to a bachelorette party he gave a tour to once. I can just imagine. We went on to sample ten more wines. Some favorites were MO/FO. Stands for Missouri Oak/French Oak. Now you have the dirty mind. See what happens when you hang out with me for too long!? I also found that I loved the Pinot Noir Clone Latache. 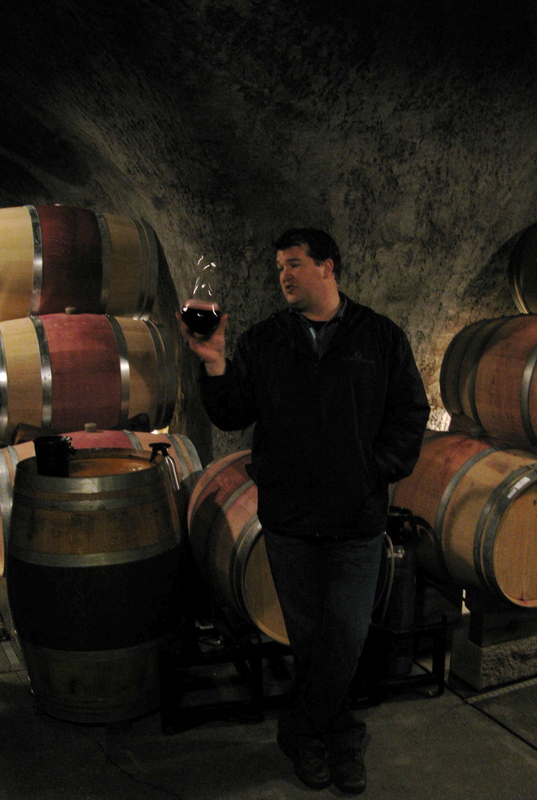 The Pinots out in Napa are called the Cabernet drinker’s Pinot. My husband really liked the Fort Ross-Seaview Sonoma Coast Syrah. While we finished sampling our wine, Giovanni brought out some cheese and amazing cured meats made (of course) by his family who also happen to have a chartucerie. 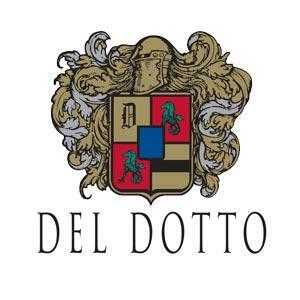 One last interesting fact that we learned about Del Dotto’s wine is that after the grapes are picked, each stem and raisin is discarded leaving nothing but the perfect fruit behind. Also, they never press their grapes. Instead, they allow the grape juices to naturally drain. Let’s not forget the disco ball. The disco ball was actually Giovanni’s father’s idea. At the end of the workday, they change the music over from classical to pop and the place turns into a private sort of nightclub for the employees to let loose. How awesome does that sound? Giovanni, thank you for an outstanding tour. 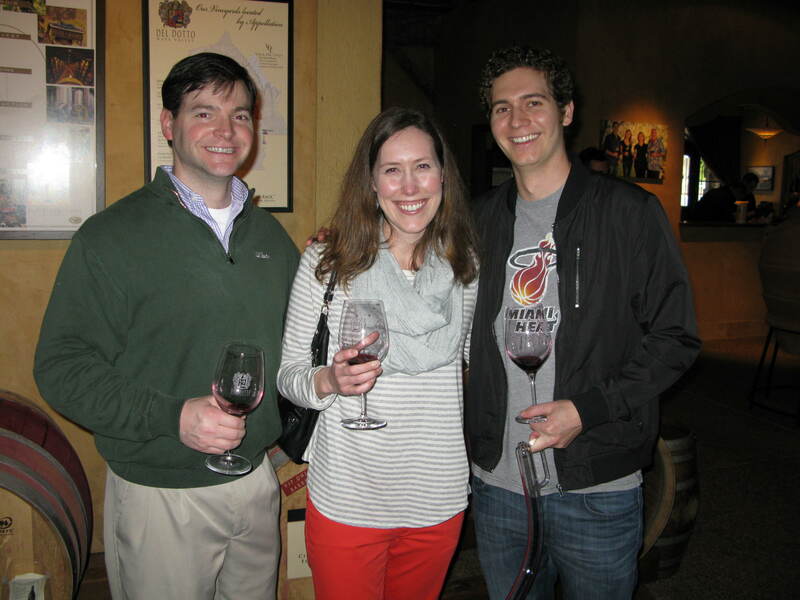 When we come back to Napa we will be visiting your winery’s other location in St Helena. Until then, we wish you and your family the very best. 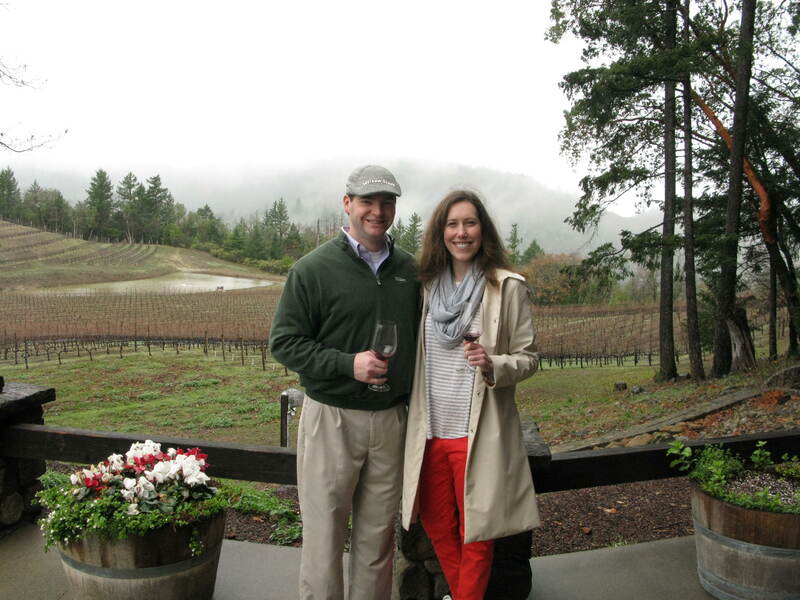 My husband and I went to Napa Valley over Valentine’s weekend. 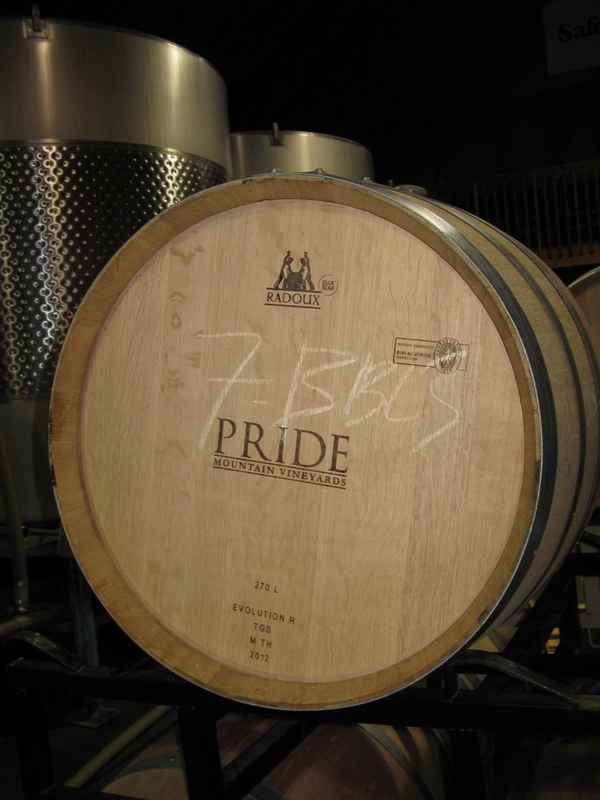 One of our favorite wineries there was Pride. Imagine driving up a very narrow, very steep hill that stretches on for miles. Huge, moody foothill pines, coast redwoods and black oaks create a mystical and enchanted forest-like atmosphere as you drive up. Couple that with the mist and cloud cover surrounding the area and you know you’re about to experience something amazing. 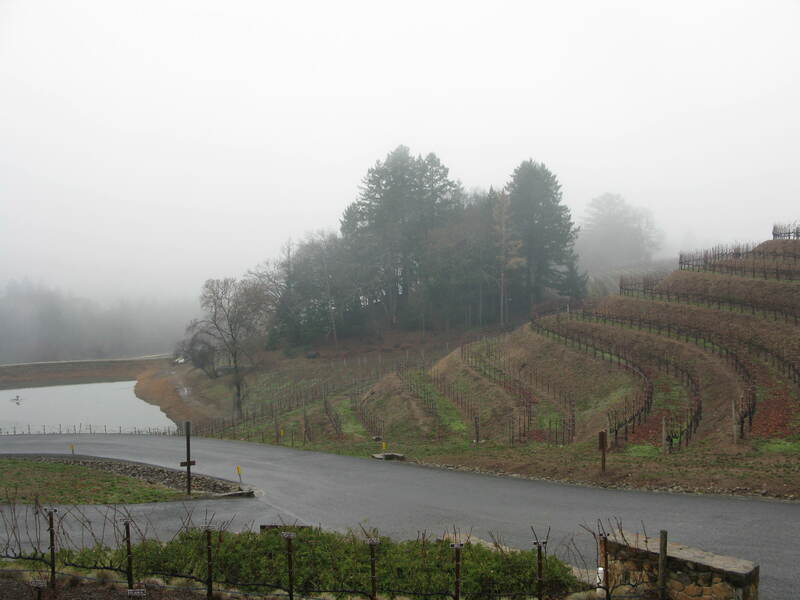 The mist began to turn into big heavy drops of rain when we reached the Pride sign which welcomed us as we entered the driveway of the vineyard. The vineyard looked a bit like the Scottish Highlands, except for the vines of course. It was interesting to learn that the vineyard is located in both the Napa and St Helena regions with the property line neatly splitting down a perfectly planted row of vines. Separation is important in the labeling and bottling so that consumers know whether they are buying a Napa wine or a St Helena one. I began to wonder if it really made a difference. Looking at all the wineries with their vineyards planted so closely together, how different could they really all be in taste? This is where our wine expert, Andy filled me in on the different soils in the area. Apparently, there are over 60 different types of soil in the world and the Napa region contains over 30 of them. These different soil textures, volcanic rock, marine, etc are just one component that have an impact in overall taste during the winemaking process. 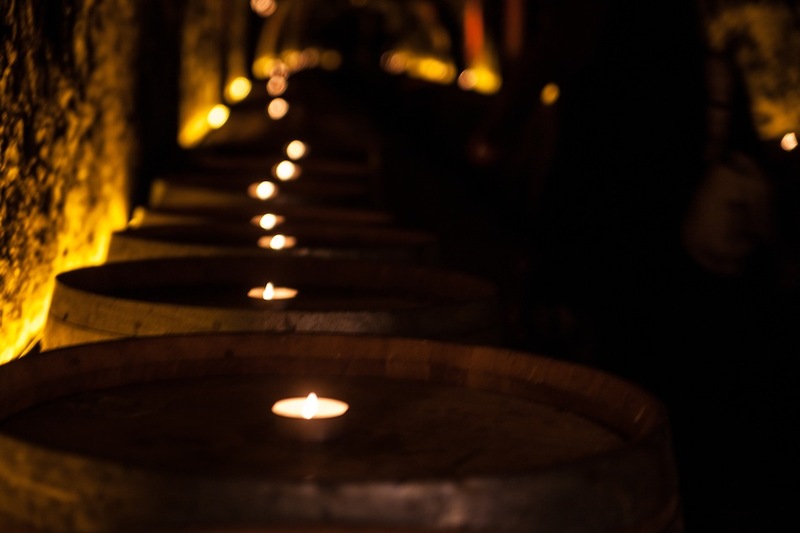 We then made our way into the caves where the barrels of wine are stored. Andy let us try a few of the wines in the cave using a handy wine tap. I need one of those in my house! 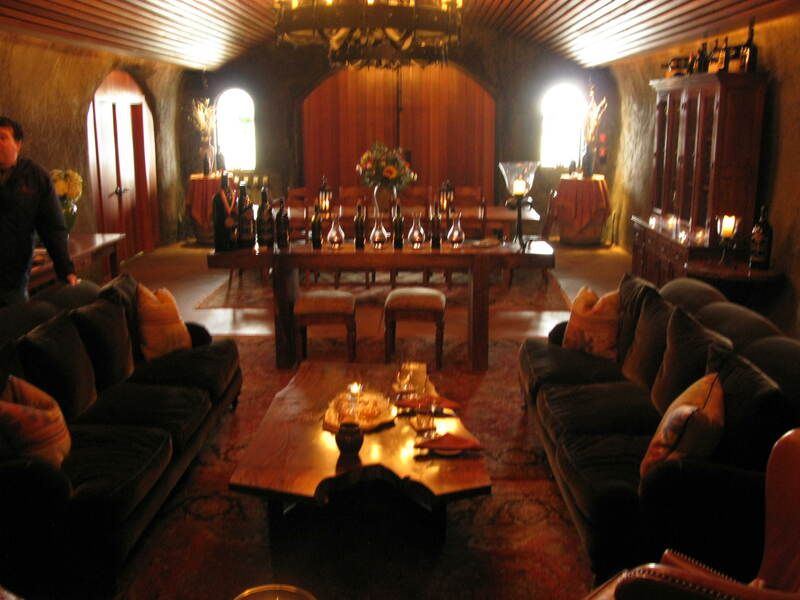 We ended the tour in a private room reserved for guests allowed to sample more wines paired with cheeses. My husband’s eyes lit up when he saw this room because it screams our taste to a tea: wood paneling, buttery leather chairs, rustic wooden tables. Ah, heaven! The picture above does not do the room justice. We will definitely be back with friends to reserve that room. Thank you Pride. See you soon…but not soon enough.